After reading Mo Willems’ classic picture book, “Don’t Let the Pigeon Drive the Bus,” I wanted to try out the other books in the “Pigeon” series and I finally stumbled upon “The Pigeon wants a Puppy!” “The Pigeon wants a Puppy” is a great follow up to “Don’t Let the Pigeon Drive the Bus” and anyone who is a huge fan of Mo Willems’ “Pigeon” series will definitely enjoy this book! Basically, this story is about how the Pigeon wants to have a puppy and constantly keeps telling the readers about how it will try to take care of the puppy and love it. However, what will the Pigeon think when its wish actually comes true? Those were the exact words spoken by everyone’s favorite blue pigeon! Mo Willems has done a brilliant job with this book as the story is extremely simplistic (it is basically just about a pigeon telling the audience that it wants a puppy). 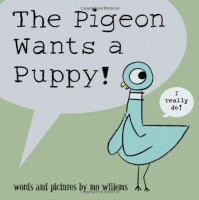 I always loved the way that Mo Willems made this story extremely funny and cute at the same time as the Pigeon constantly tells the audience that it wants a puppy and I loved it when the letters on the pages are highlighted in red whenever the Pigeon gets overexcited or angry as it really adds to the Pigeon’s emotions about the situation. Mo Willems’ illustrations are as always simplistic with a touch of your usual humor as the pigeon has big round eyes and is blue and the illustrations look like it was hand drawn by a child as the characters look extremely simple. I also loved the image of the “puppy” at the end of the book! I will not tell you what the puppy looks like, but it was certainly surprising to look at such a puppy! Overall, “The Pigeon Wants a Puppy!” is a fantastic book for children who also went through the same situation about asking their parents for a puppy or something they really want and I think that many children will read this book for many years! I guess if there was a problem with this book, is that the Pigeon might seem a bit demanding in wanting a puppy and parents might want to alert their kids about not being too demanding about asking them want they want, but this book is still loads of fun for little kids ages four and up!